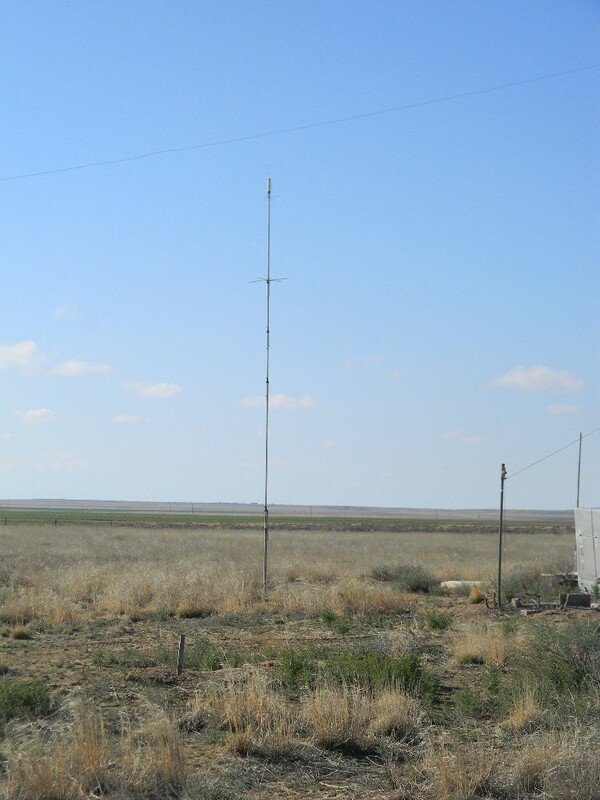 The following is the report of our work trip to the Plishner antenna site in Haswell, Colorado on Sunday April 22, 2018. This was written by Ed Corn KC0TBE, with additional contribution by Dave Molter AD0QD, and with editing and photos by Gary Agranat WA2JQZ. Steve Plock (KL7IZW), Ed Corn, and Gary Agranat left the Ellicott Fire Station about 7:30 AM, and arrived around 9:30. Dave arrived just a bit later. We met Paul Berge (K0DJV) at the site, who had traveled down on Saturday from Lyons and stayed overnight. Paul had done some clean-up in the bunker. And he cleaned out the pile-up of tumble weeds from the bunker ramp. Steve worked on the locking system for the box with the azimuth/elevation hardware in the pedestal. He reports moving the dish antenna down to 0° elevation and back up to zenith with no read-out errors. The lock holds the door securely shut to form a good shield from motor EMI (interference). 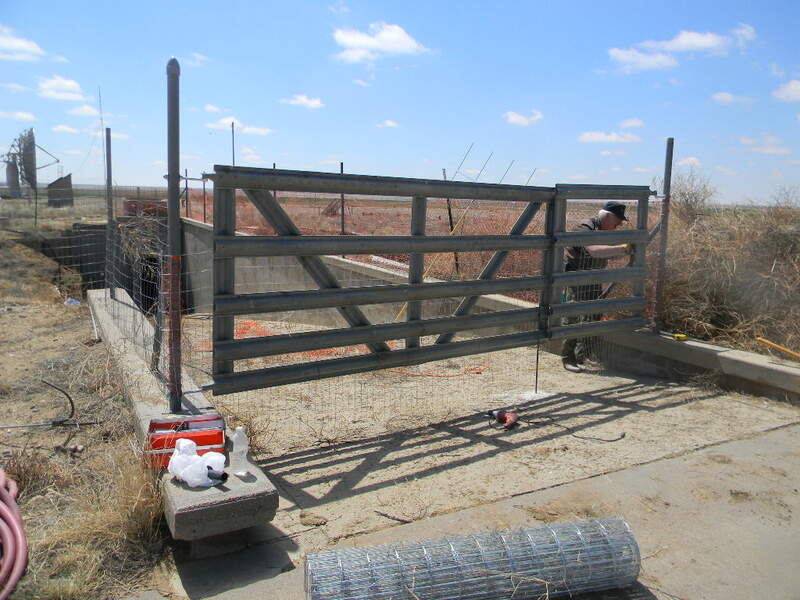 Ed installed a stronger fence at the bunker ramp entrance. 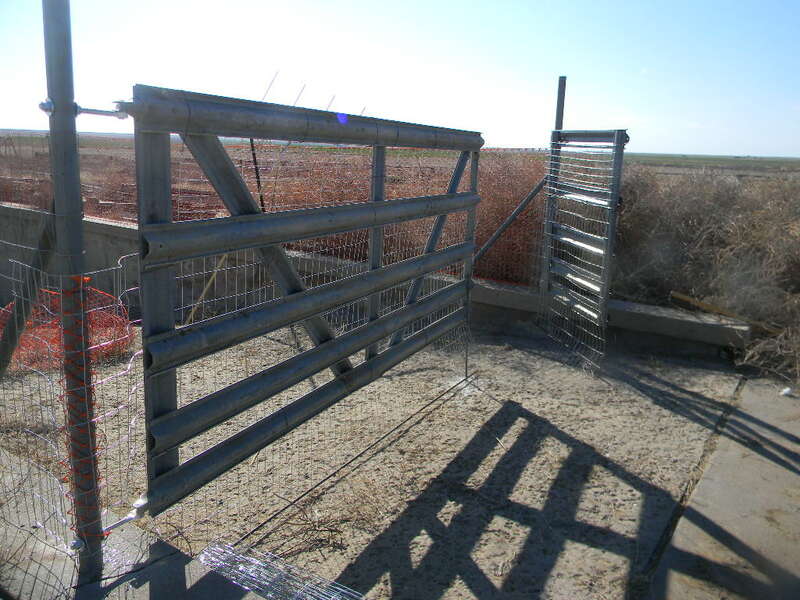 Ed built a more robust gate for the bunker ramp. 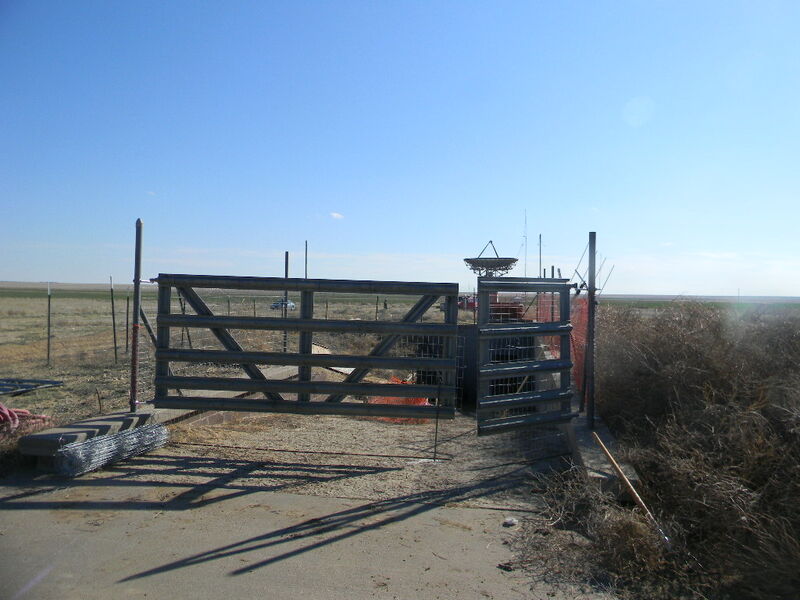 The strong winds at the site had unhooked the previous gate, which then allowed tumbleweeds to pile down the ramp again. Ed dragged two farm gates from west of the Communications Trailer to the bunker ramp. 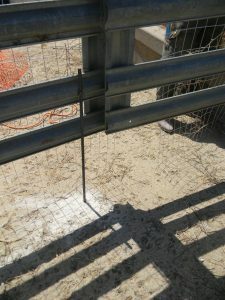 He set up the hinge pins for the gate, and Gary helped hang the gate. 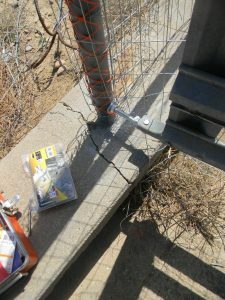 We then covered the gates with field wire (in the gaps and along the bottom) to keep the tumble weeds from getting into the ramp area. Ed then installed a VHF base antenna on the bunker dog house for the talk-in radio. 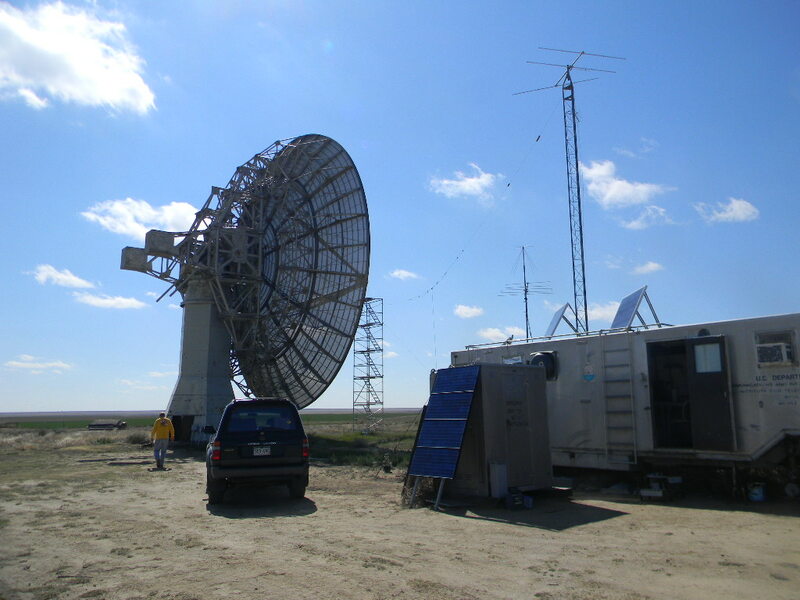 The talk-in radio, K0PRT 146.460 MHz, is now up and working, with desk remote controls in the bunker and communications trailer. Please note the desk remote control in the comm. trailer must be plugged into an outlet and powered on to operate. This arrangement keeps the RF at the bunker, and gives access to talk-in radio at the comm. 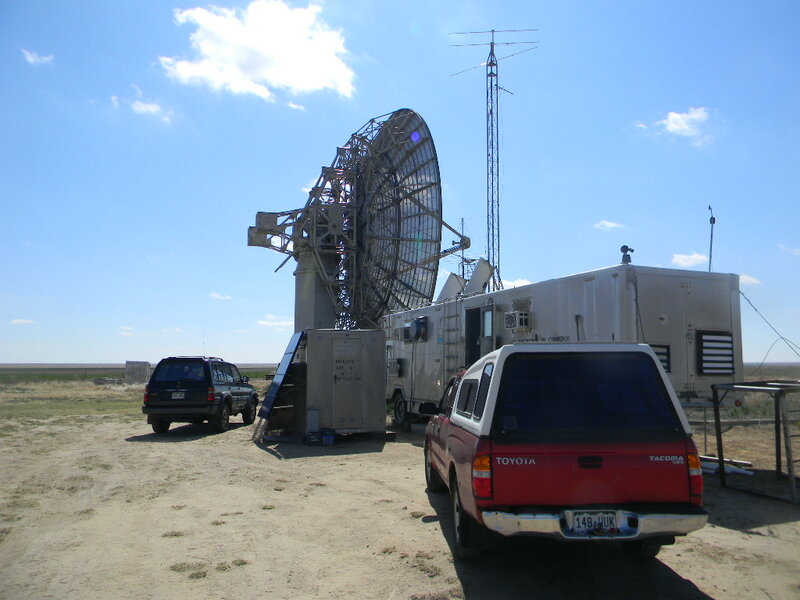 trailer as well, without RF emissions near the 60-foot dish. 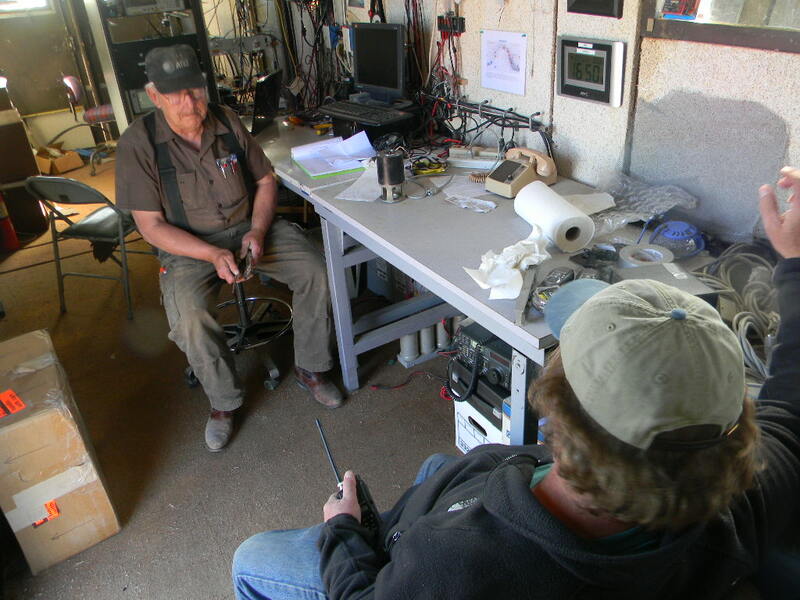 Ed installed a talk-in VHF radio system for the site. 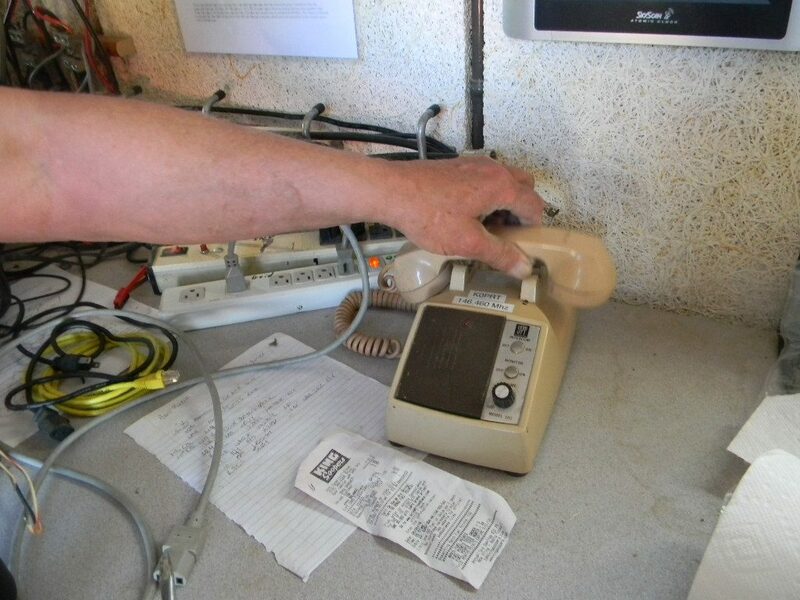 The remote control phones for the talk-in radio system are at the communications trailer (pictured) and in the bunker. The power plug-in for the comm. trailer phone is right next to it. 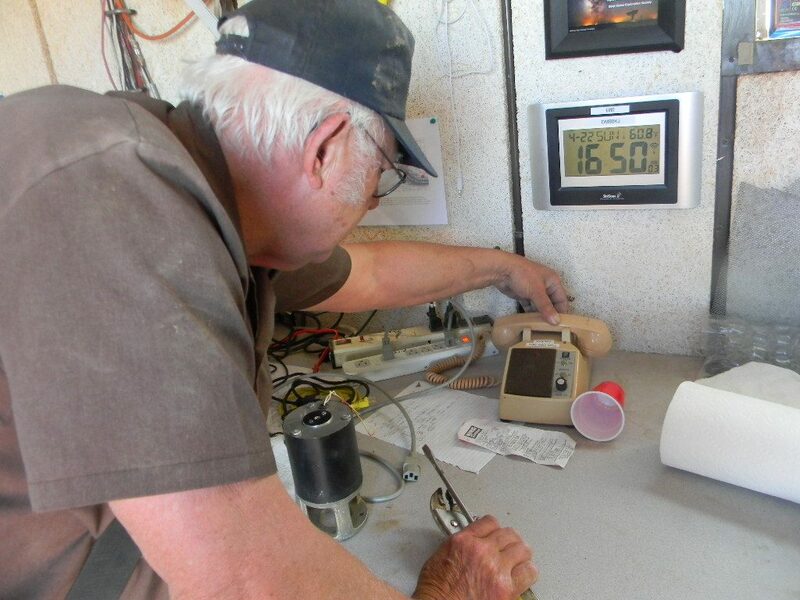 Gary continued work on the Hustler 5-BTV HF vertical antenna for the club station at the bunker. By the end of the day Gary had the vertical assembled and mounted on an anchor pole he installed with Dave’s help. The vertical is in place with non metallic guys for stability in the Plishner winds. Gary doing final assembly of the vertical HF antenna. The Hustler 5 Band Vertical Trap Antenna mounted to the base post near the bunker. 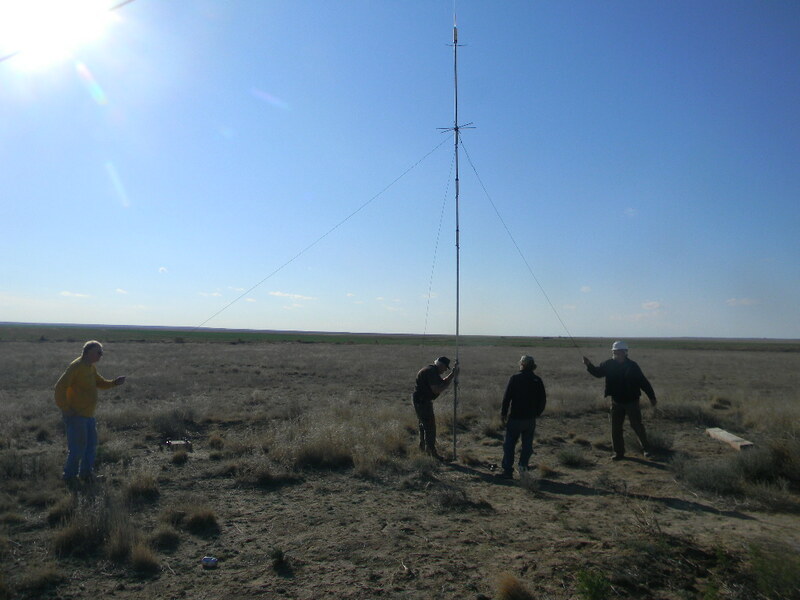 The team set up the HF vertical ham antenna with non-conductive guy ropes northwest of the bunker. 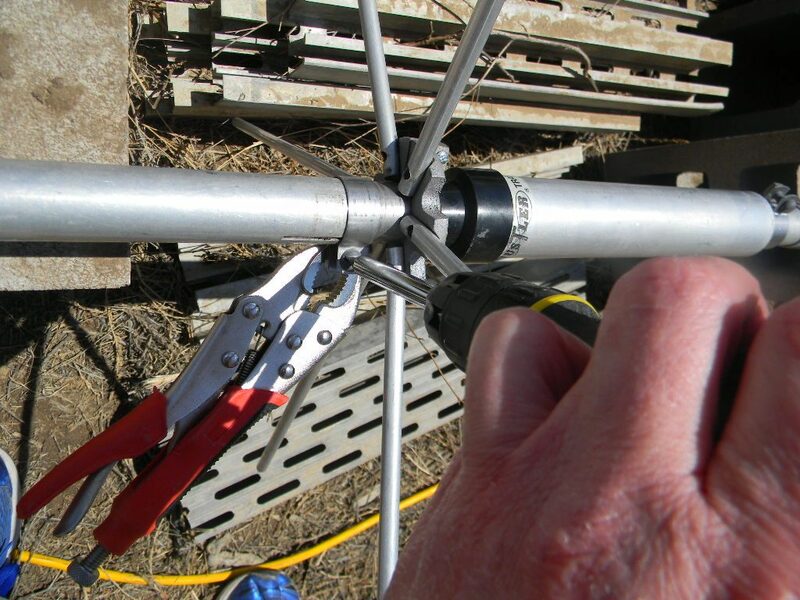 The antenna will add 10, 15, 20, and 40 meter band capability to the bunker ham radio station. The bunker already has 80 and 160 meter dipole antennas. L to R: Dave, Ed, Steve, and Paul. Dave unloaded a truck full of concrete blocks, bagged cement, and mortar mix for use in the retainer wall extension at the bunker. Then Dave and Paul used the rest of the day to work on the antenna dish controls. They also lowered the 2 old drive motors from the pedestal control deck to the floor in preparation for removal from the site to salvage. Dave walking back to the pedestal of the dish antenna. Ed and Steve talking in the Com Trailer, at the end of the day. Steve created a chart map of astronomical radio sources, which he placed in the Com Trailer (the white chart behind the remote call-in phone). 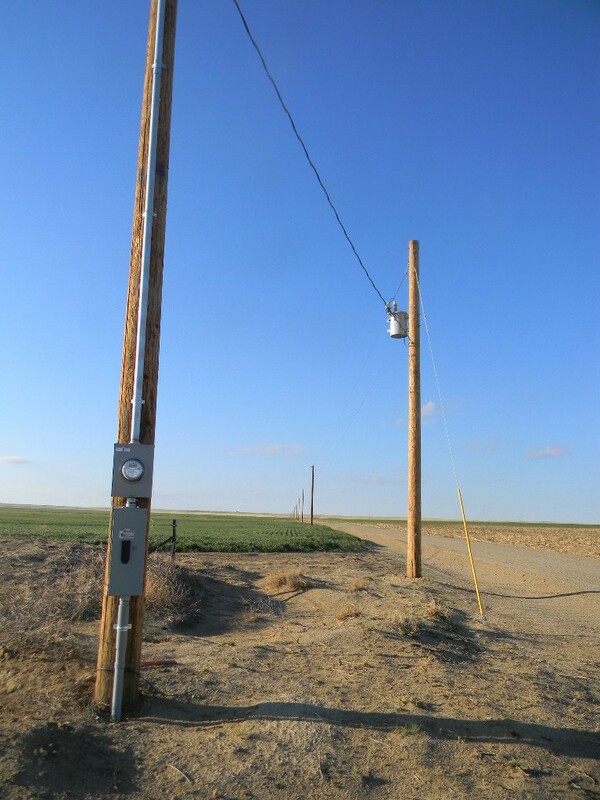 The commercial power feed at the site entrance on County Road 20, installed earlier this year. The completed, more robust, fence at the bunker. Paul stayed over Sunday and Monday nights, traveling home on Tuesday. 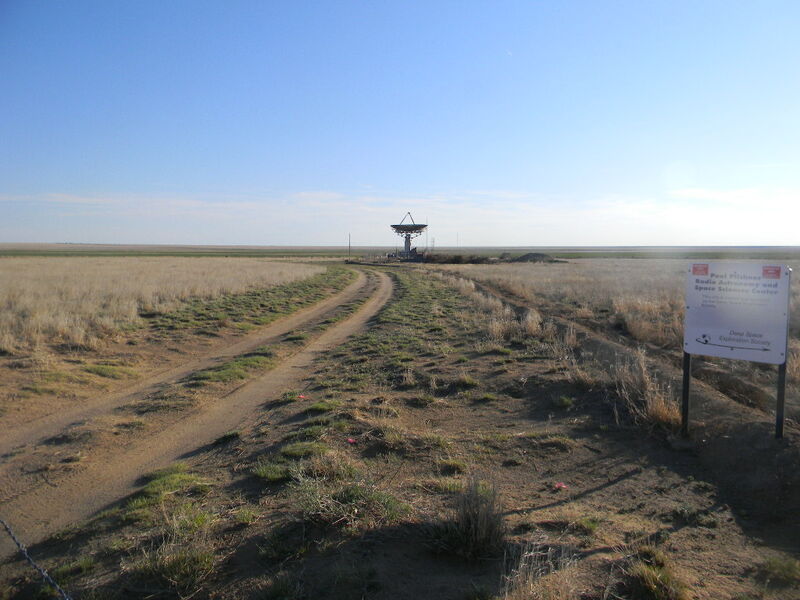 He spent Monday doing routine maintenance and clean-up on the dish drive systems, which had been delayed and was past due. Thanks to everyone for a very productive work weekend at the site. Please attend our annual all members meeting to be held on Saturday, April 14th at 1:00PM in Monument Colorado at the La Casa Fiesta Restaurant www.lacasafiesta.net in the Garden room. This should make it a little more convenient for our northern Colorado members to attend. Gary Agranat, Myron Babcock, Steve Plock, and Dr. Richard Russel. Seven Board Members are elected for a two-year term with 4 and 3 elected on alternate years. The other three board members elected on the last election cycle are, Floyd Glick, Dave Molter and Bill Miller. At the annual meeting we will elect the officer seats for President, Vice President, Treasurer, and Secretary from the board members, and we will also give the annual activities report and treasurers report as well as discuss future project plan and new business.